Washington-based artist Tip Toland creates larger than life figures with painfully accurate details that highlight her subjects’ imperfections: wrinkles, sunspots, and other blemishes. Toland’s work has always dealt with figurative subject matter, though her approach has ranged from the surreal to the super-real. 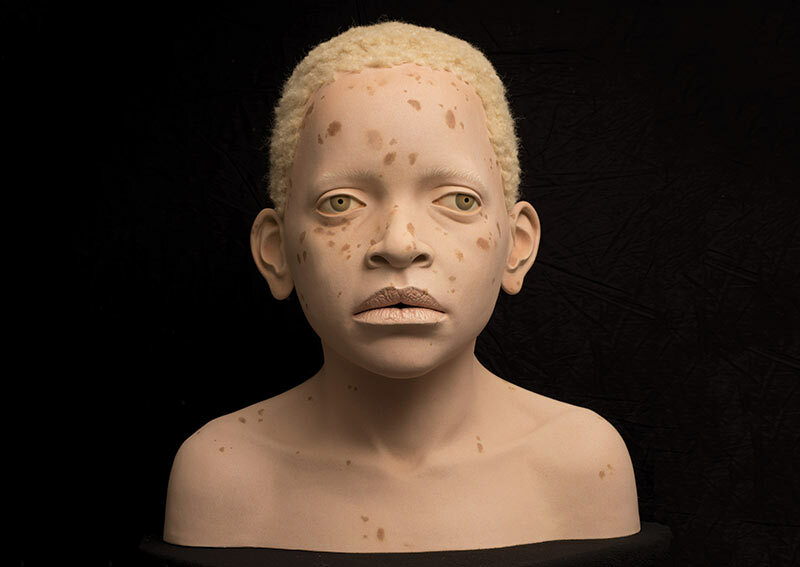 This exhibition focuses on the plight of albino children in Africa, many of whom face a never-ending nightmare of bigoted, superstitious persecution at the hand of the communities into which they are born. Deeply rooted in psychology, Toland’s carefully crafted portraits seek to disturb viewers, teasing out their deepest human sympathies only to clobber them with the cudgel of political subtext. The artist has said that her work “softens our hearts to what we are afraid of.” Unflinching in the face of terrible realities, it is certainly provocative.